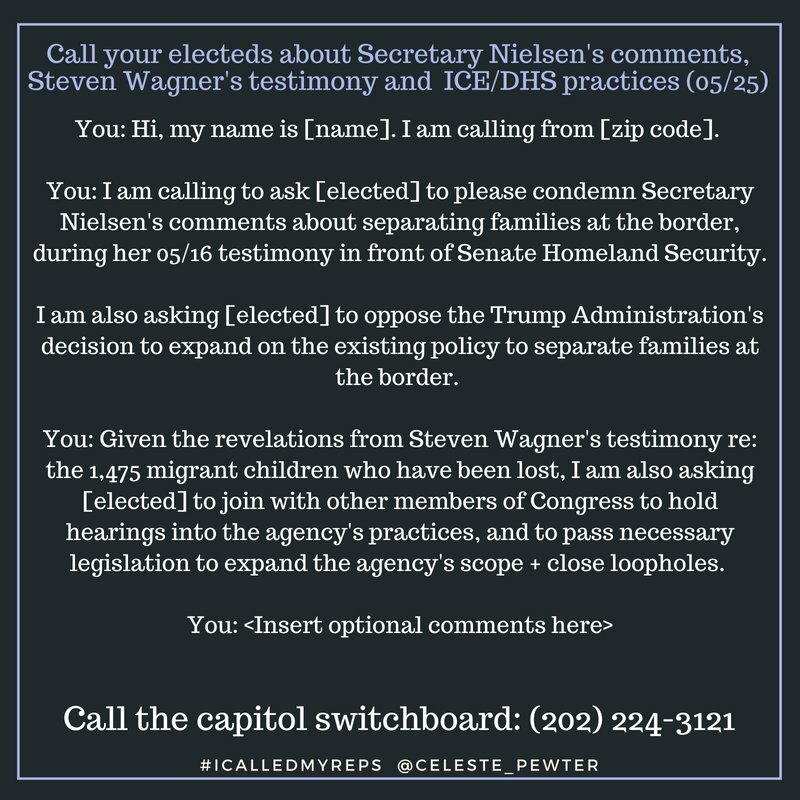 Call your members of Congress (MoCs) and raise absolute holy hell over how Immigration and Customs Enforcement (ICE) is treating migrant families and children their care. Holy crap. I mean, holy crap. The Trump administration has done a lot of hideously beyond-unacceptable things since it took office. The latest news about how ICE is treating migrant families represents a new low. The Department of Homeland Security (DHS) is pursuing a policy of separating parents and children who arrive in America after fleeing their home countries. According to a New York Times article, more than 700 children have been forcibly parted from their parents since October 2017, and more than 100 of those kids were four years old or younger. Cites are at the tail of this post, but do we need to tell you how utterly disgusting this is? ‘Disgusting’ doesn’t even cover it. All the words that leap to our minds are forceful swears. And that’s before we get to the fact that White House Chief of Staff John Kelly defended the policy on the notion that it could serve as a deterrent, and claiming that the separations would be OK because “the children will be taken care of — put into foster care or whatever”. Since Kelly made that jaw-droppingly cavalier statement, news broke more widely that the government has somehow “lost” 1,475 kids who came to America as unaccompanied minors (so, to be clear, they came here alone, and the government did not separate them from their parents) and were subsequently placed with sponsors. In Congressional testimony given on April 26, 2018 by Steven Wagner, acting assistant secretary for administration for children and families at the U.S. Department of Health and Human Services, said that the agency tried to reach 7,635 children between October 2016 and December 2017 who had arrived as unaccompanied minors. The 1,475 it failed to contact represent 19 percent of the total. Worse, the PBS show Frontline has since confirmed that at least a few of those “lost” children who arrived unaccompanied were released to human traffickers. So, to sum up: The Trump administration thinks it’s A-OK to force families who have fled to America to part, holding the parents in one venue and the kids in another that could be thousands of miles away. The administration is OK with this despite the fact that they know the system is horrifically broken–they know they’ve lost track of about 1,500 migrant kids who came here alone and were placed in care while waiting for their cases to be heard. Oh! And that policy he’s blaming on the Democrats? He wants to expand it. Because of course he does. We’ll wait for you to finish throwing up. Done? Ok. Here’s what you can do to fight back. You can call your members of Congress and demand action. Unsurprisingly, Celeste Pewter got there first with a fine script, which we are reproducing here. Note, however, that during the week of May 28, 2018, your MoCs are most likely in their home districts. Please go to their Congressional websites and pull up numbers for their state offices and call those rather than the D.C. switchboard number given in the script. If you’re not following Celeste on Twitter, please do: @Celeste_Pewter. Also, scroll down for more ways to support her work. In addition, there are several charities that help migrants that would welcome your support. Lastly, you can follow #WhereAreTheChildren on Twitter for news and updates.